Anna's goals as a trainer reflect her experience with active living. She believes that finding activities you feel passionate about creates a more enjoyable life that is beneficial to one's health. Anna has a positive attitude, and tries to pass it on to all of her clients. She is also a firm believer that exercise is the best stress reliever. Some of her passions include, soccer, snowboarding, squash and biking. 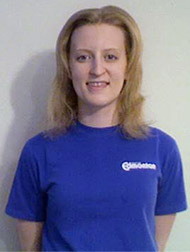 Anna has experience training people for the A-PREP and PARE fitness tests. Her ideal clients include people who are new to the gym environment, people looking for more sport-specific training, or anyone looking to improve their quality of life.